It’s no secret – any well-known brand you see on a regular basis is already playing with a localization strategy to increase market reach. For your message to resonate, you need to be thinking not just at a regional level, but about your global customer experience. 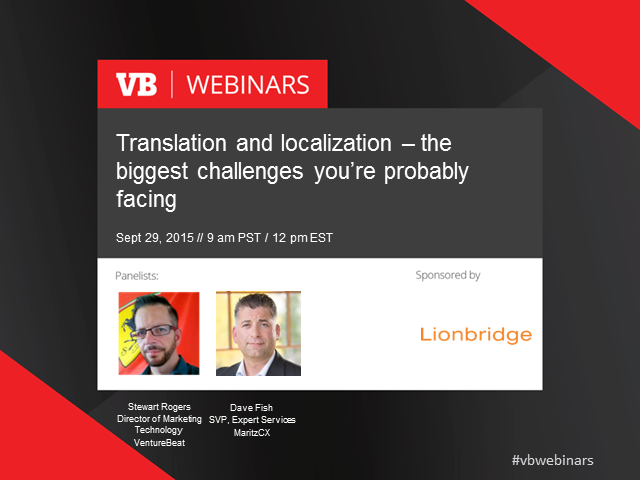 Localization isn't limited to simple translation -- you can't set it and forget it. Companies shouldn't assume, for instance, that a campaign created for Spain will be equally as effective to all Spanish-speaking consumers in the U.S. or Mexico. It's not just language, but cultural differences. Consider the message you might send to someone in Berkeley, California, versus one you might send to someone in Phoenix, Arizona or New York City. And once your unique branding content has been sent out to different geographies, your localization efforts aren't over just yet. True experts understand that the campaign as a whole is not a sum of its parts -- a campaign's success can be in the granular regions, creating a truly unique customer experience with that added local flavor to resonate within the audience. We'll walk you through the most common challenges that companies make and help you improve your campaign's quality, accuracy and relevance to reach the right consumer. We'll give tips on not only improving the localization process but help you deliver better metrics to senior leadership that tell the true story of your brand’s globalization. - Make your branding as world-ready as possible.